There are quite a number of people looking to turbo their N/A TD42 and the biggest problem at this stage is the manifold availability and price. The second hand ones are very scares and at the moment there are not any available as I am looking for one. 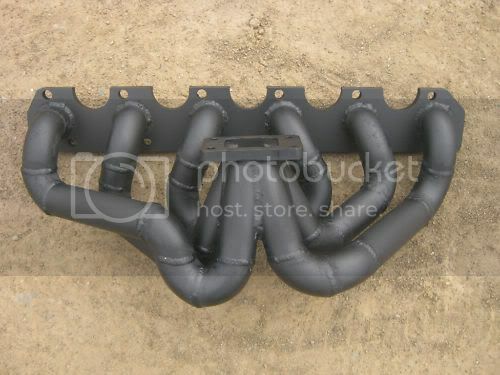 New they cost around R8,000 from Nissan and I think that is just too much money to pay for a manifold. One option is that we can get new ones "casted" and machined for half the price. Who would be interested in going this route, the more we order the cheaper it will get so I recon we should get away for between R3,000 and R4,000 for a manifold. Just throwing a spanner in the works Michael, as i don't know what the costs would be compared to a cast manifold. I have a set of branches on my TD42. If one makes them up it will also allow a bit of movement for positioning of the turbo, especially for the exhaust dump pipe as it can land up being quite close to the firewall. I'm not sure if you get better performance on the diesel with branches on, and bear in mind that it is also difficult to have a heat shield as is on a standard cast manifold. I have a rectangular piece of stainless steel offcut shimstock (about 150mm x 600mm fixed between the branches and the top mount IC that deflects the heat back down, secured with the bolts on the rocker cover. I would think that branches would also give a better, unrestricted airflow due to no sharp 90 deg bends. Cedic they want dik money for that and guys like andre steyn says his welded one is letting him down ....probably a reason why they make manifolds from cast iron in the factory. ....i will wait and here from Piet on that one ......i like the top mount turbo more ...UD does it that way ....let me put a pic . Hmmm... Mine is holding up pretty well, I've had the Iron Maiden now for 6 years, and those branches were put on there if I recall correctly from investigations I did years back, by the previous...previous owner. So I would guess more than 10 years back, without any signs of leaks or cracking. The only thing supporting the turbo and exhaust is those branches !! But if they cost a lot more than the cast manifold, then not worth it..... unless there is a worthwhile power gain. Yes all valid points you have there. 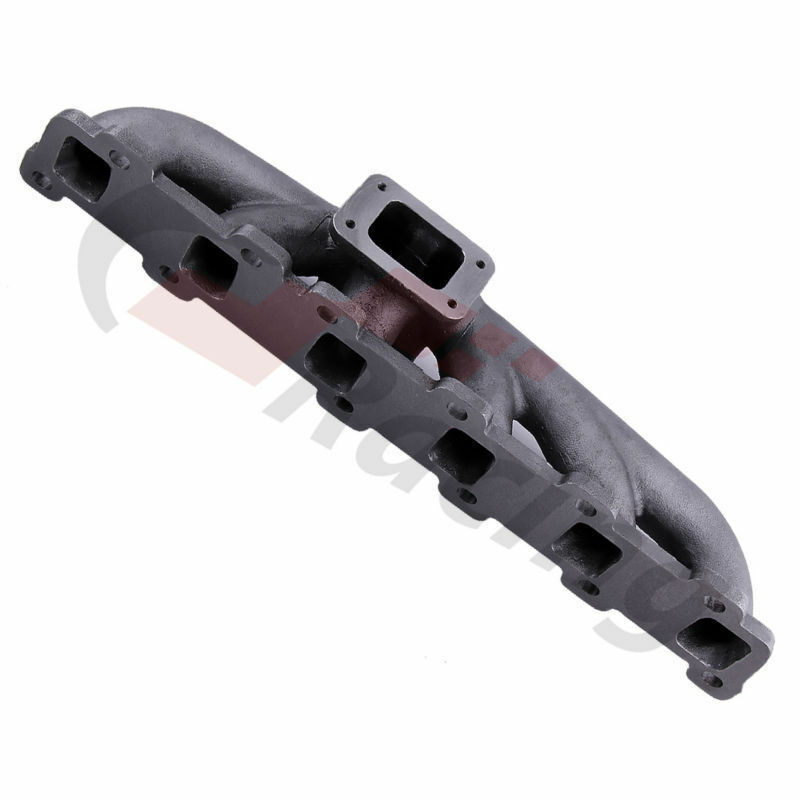 Problem is to find someone to build a branch manifold for a good price and also to get them adding a guarantee. If there is someone who can make a branch manifold for cheap we can definitely look into it. Looking at a cast manifold, I do think it can take more of a beating than a branch manifold. It might not give quite the same performance, but that's not what we are after so don't think its a real problem. If doing a specialized casting, it would be quite easy to put on a coulle of "lugs" to mount a heat shield. If it looks something like Tinus's, it would also be simple to put in a lug from underneath at the turbo flange (thus at the collection point) for mounting the EGT probe. Just make sure it gets drilled and tapped as standard and before installation. As for performance, i can't really comment but have been told that it mostly affects spool-up time. How much (and how much money that's worth) would be a question for the owner to sort out. I have had three sets of branches in my life. Two of them have cracked, and one basically fell apart completely, although i believe that was a result of adding heat shield tape to an old manifold. I suspect the life of a set of branches is lroportional to the skill of the welder. There is no doubt that a very compact manifold like the one shown above will be more robust. Yeah I agree a cast mani will be the most ridged for sure. I purely threw a spanner in the works, not knowing the cost to make up a proper set of branches would be. Cedric, you talk about having a branch setup on the Maiden. I would imagine the welds or pipe seams would be the first to let go if something has to give. The cast iron manifolds would take up a lot less space and have less of a fulcrum action with the turbo hanging off of the end. I've made a big enough hole for myself already. I don't want to be that guy who has to pull out at number 99 when people have put so much effort into something. Let's see who else is in on this. Lyk n td42 manifold anders as 'n tb45 sin? (my 4.5 het branches op - so kan nie vergelyk nie).